I know we probably all wish we had beauty stations like this one. 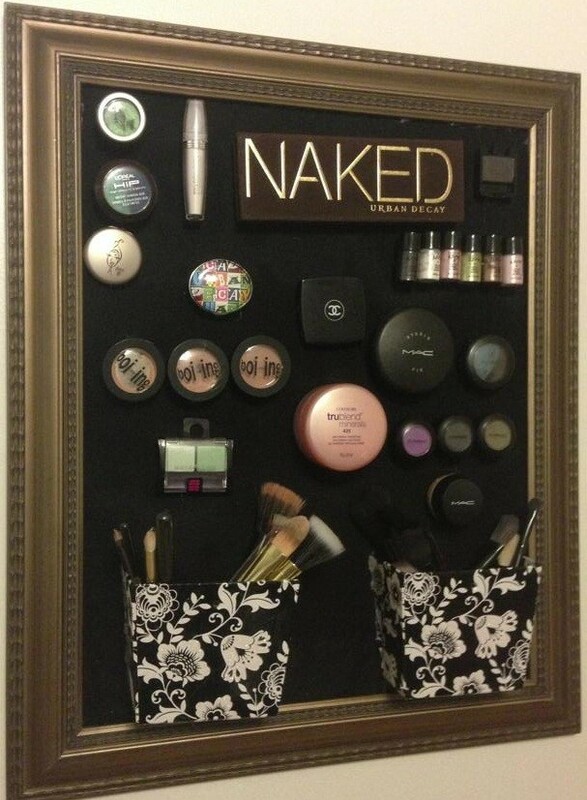 Hell, my main goal in life is to have a beauty ROOM. Unfortunately for me though I still live at home with my dad and sisters and because I am the oldest sibling I have the smallest room (how does that work, right?). So seeing as space is tight I have to be very clever with my storage, mainly when it comes to my make-up collection. This post is going to focus on some easy ideas to help you attain a space conscious make-up area that still looks gorgeous. 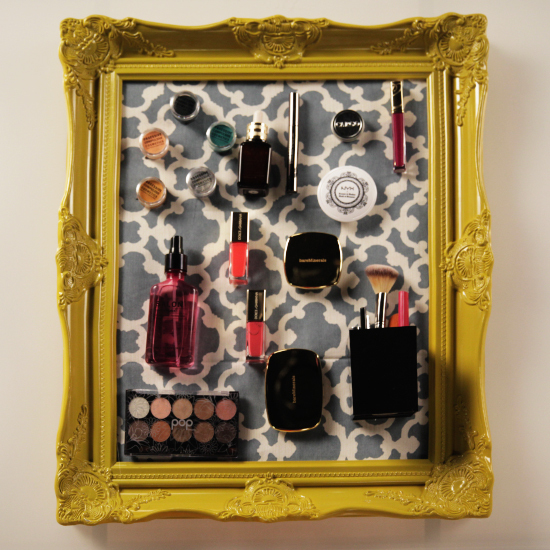 There is one secret word when it comes to make-up storage. Stationary. 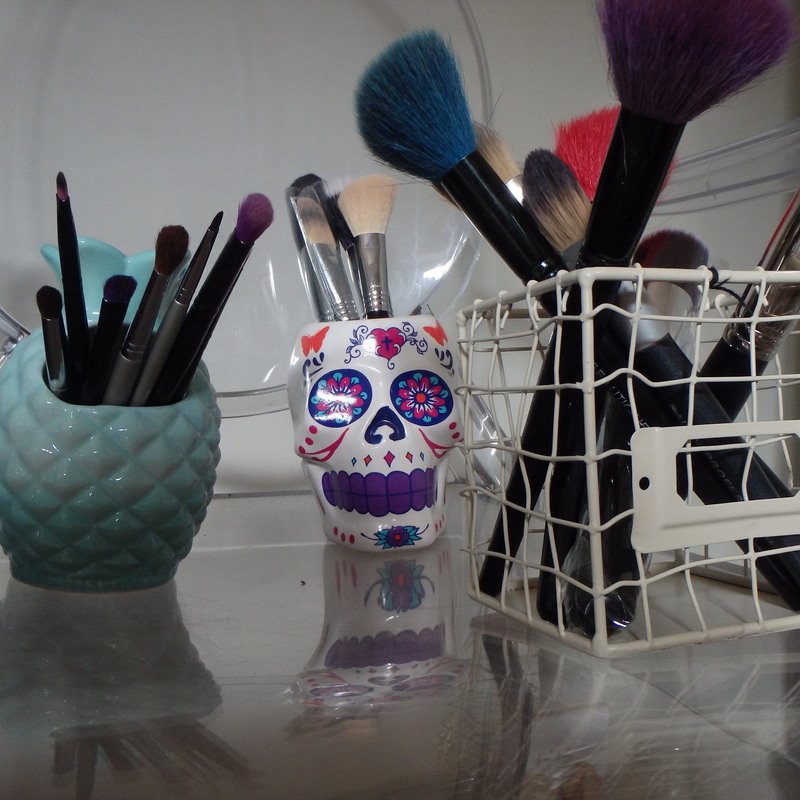 The majority of my make-up storage is made up of envelope holders and pencil stands! Here are a few pictures as examples. 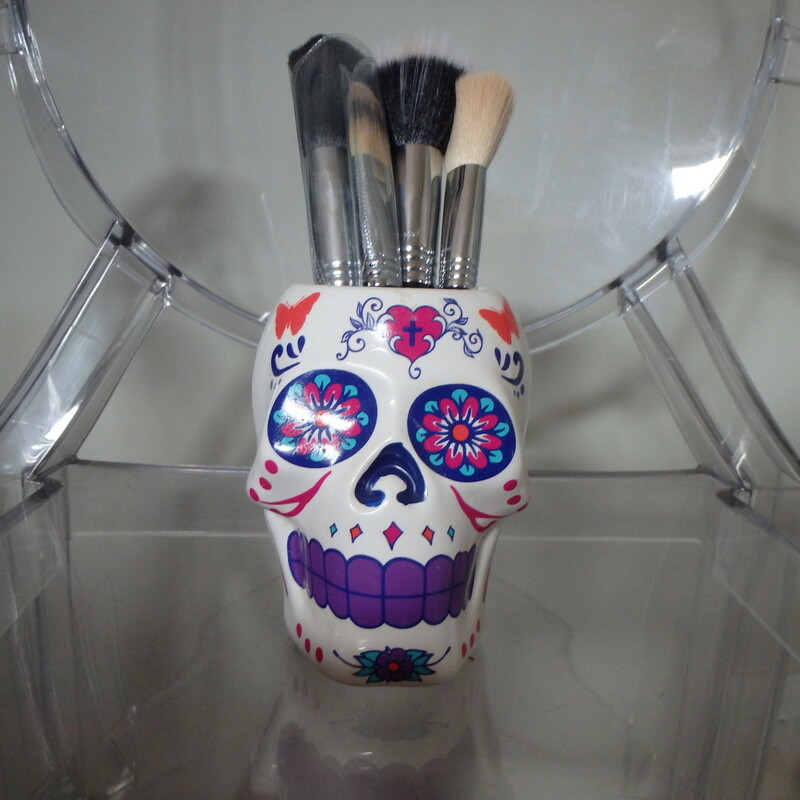 The skull head holds my Sigma Face Brush collection and cost me only R40 at the Typo Factory Outlet. It originally cost R89 which is already an awesome price. The pale blue pineapple holds all my eye brushes and cost R30 from the same Typo store. Then the wire block which has all my lower end and MAC brushes cost only TEN RAND from, yet again, that faithful ol’ Typo store. It’s always a good idea to have little bakkies around your room to hold all your odds and ends in. I find this little heart tub perfect for earbuds, sharpeners, tweezers and hair elastics. 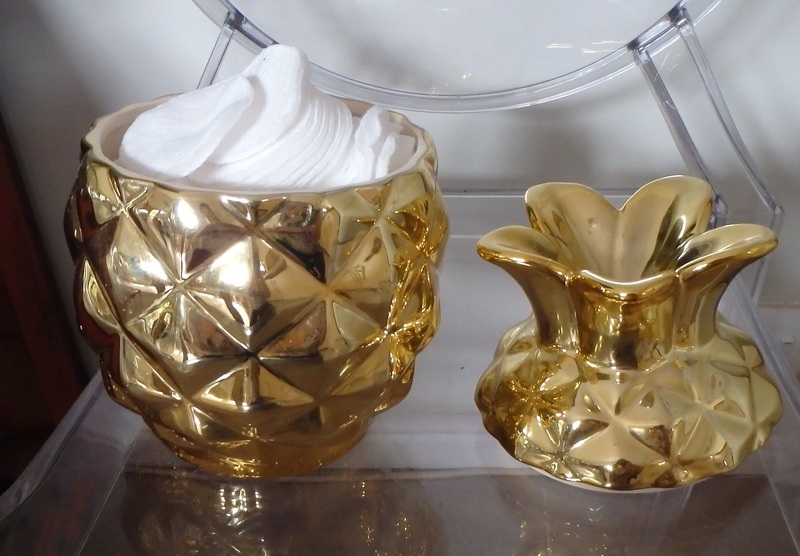 This giant gold pineapple from Typo was a bit pricey at R249 but it holds more than 100 cotton face pads in it, and I use cotton pads as if they’ve been discontinued. Now, this is the crème de la crème of my bedroom. The main attraction. The bee’s knees. The cat’s pyjamas. 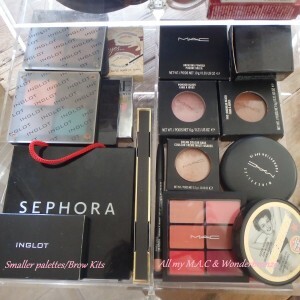 My Clair box. 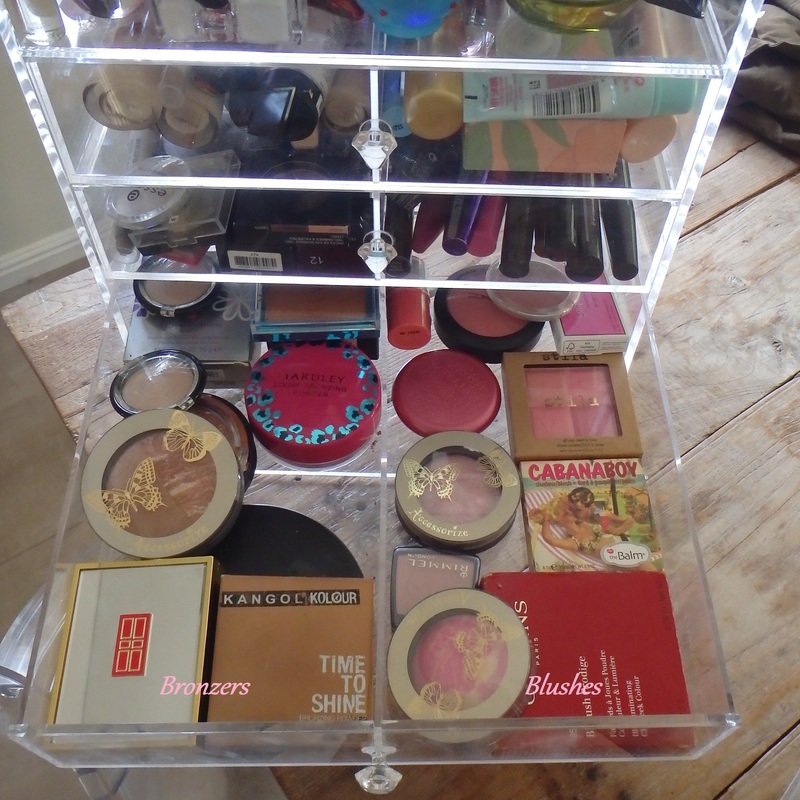 My company designs and sells these gorgeous acrylic make-up storage units, and believe me when I say this; they are LIFE CHANGING. I know, I know, this sounds like way too much self-promotion but this Clair has been the game changer in the way I look at make-up. The box itself is 300mm x 300 mm x 400 mm, has six layers; five drawers with removable dividers, a flip lid and sweet little diamante handles. 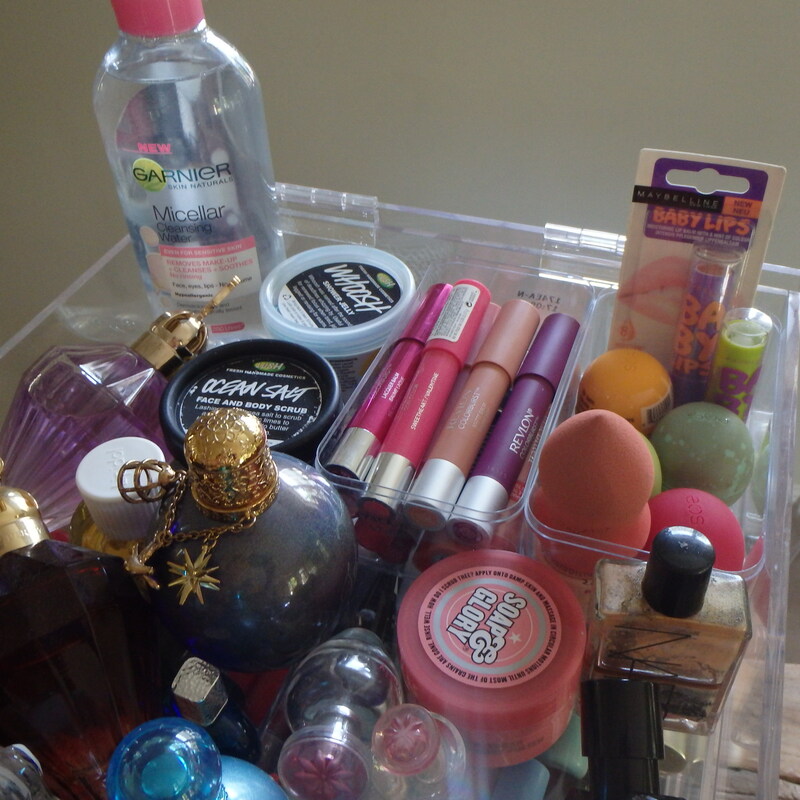 In this box I have 9KG of make-up stored neatly away. Yes, NINE KG of make-up. 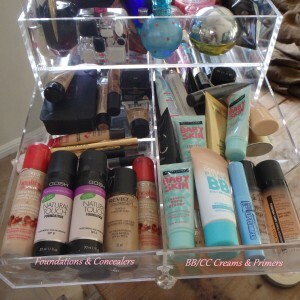 I am contemplating getting a second box as it’s just SO gorgeous and the space I have saved by using this to store my make-up is crazy. 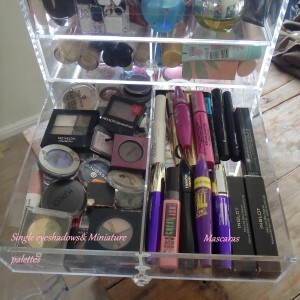 But I just feel that I may easily purchase another 9KG of make-up if I know I have the space for it. 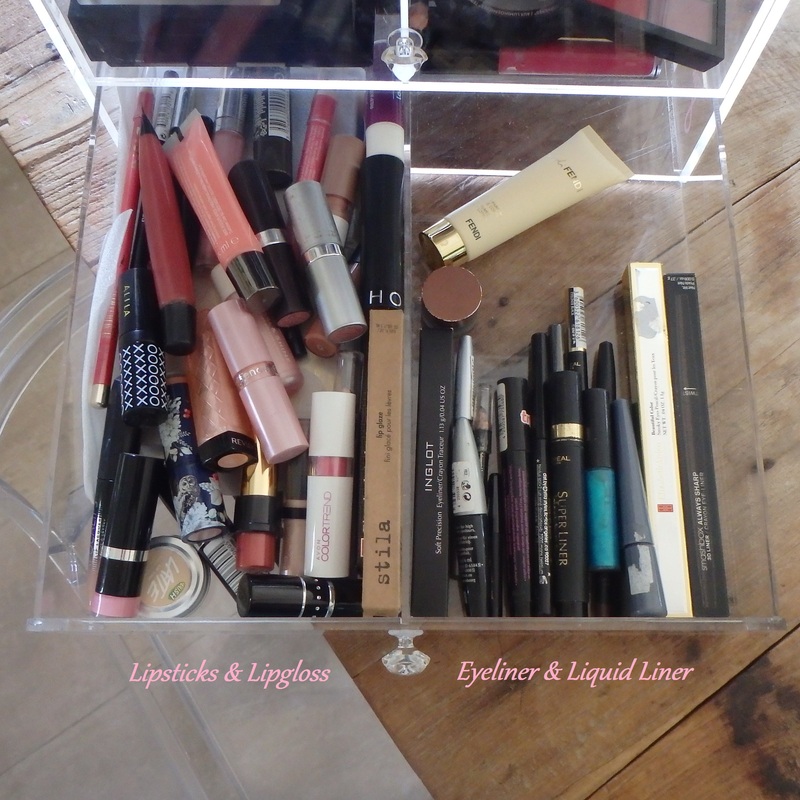 The separate drawers allow you to divide your makeup into different sections. 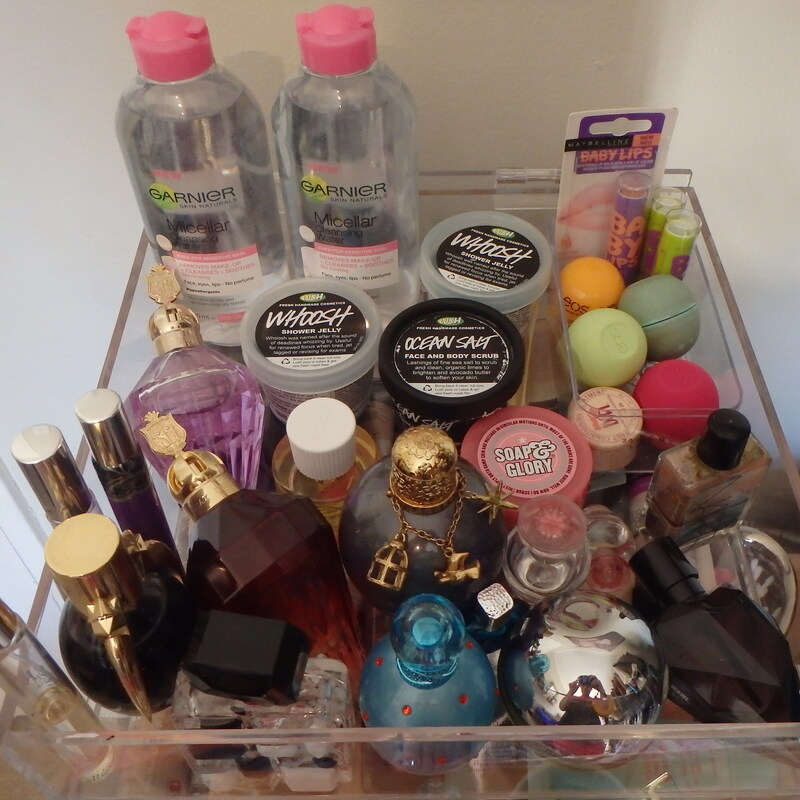 For examples you can see how I have labelled my drawers. I know they are suuuper super untidy right now. SOZ. The top part I use to store my perfumes, balm stains and a few other randoms. 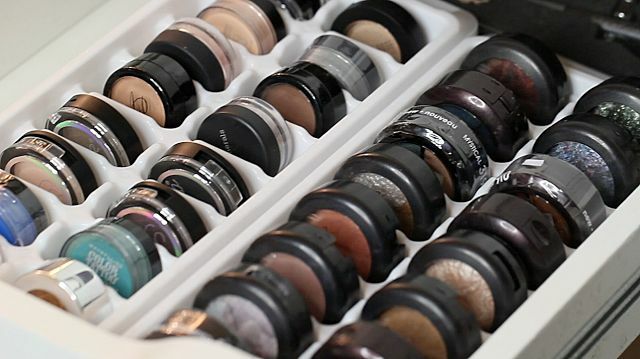 A fantastic idea for storing eyeshadows is to find ice-cube trays that your pods fit into. That way you can see the colours easily and it’s difficult for them to break. You can then put them into drawers and they look super cute all stacked together. We also have a smaller unit – the Pluie display – available for purchase. Thanks for reading! 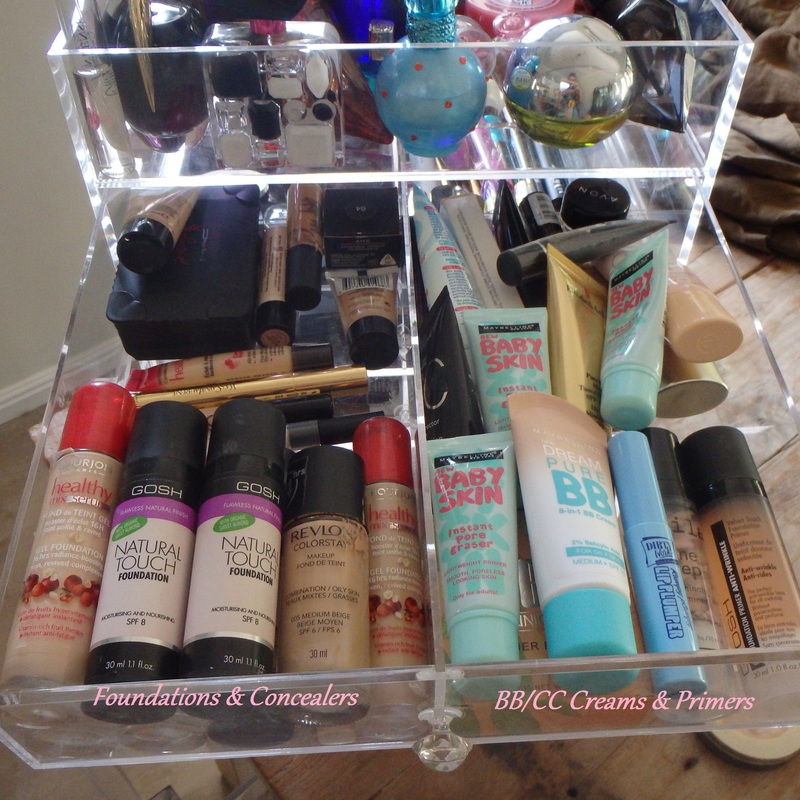 I would love to see your posts on your own make-up storage, please leave links! 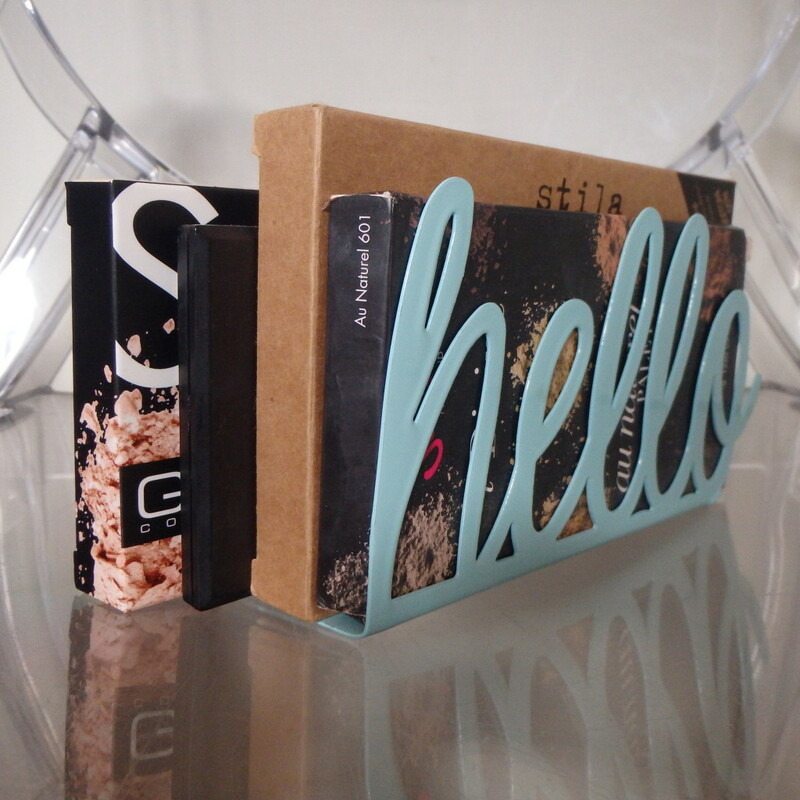 I love how you used bookends to hold your palettes! Hi Rayne, what a lovely post. You make it sound so easy to get organized and I will definitely use some of the tips you mentioned here. Thanks for giving us addresses and ideas where to buy the items. I love the magnetic board. So chic!